The MySol is made from two layers of high-quality woven wrap fabric that nestles like a second skin around your baby and provides optimum support. 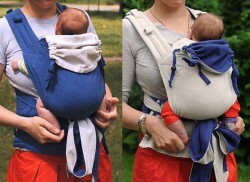 It may be worn with either side facing out – two differently coloured carriers in one! The width of the material between the legs may be smoothly and easily adjusted, which is important for the seated position with legs spread apart and for encouraging the healthy development of the hips, particularly during the first year. The back section may be extended such that the carrier will still safely and comfortably fit - even through each growth spurt. The integrated hood supports the sleeping baby's head and protects it against the sun; the hood's width is also adjustable. Padded shoulder straps and a padded and stabilized hip belt also make the MySol comfortable for the person carrying the baby. During development, Girasol intentionally decided not to use hard plastic components, clasps, buckles and complicated adjustment features but did create a strain-relieving chest belt for the back carry position and a practical hip belt for such important small items as purses and keys.